ironSource’s Ad Settings Dashboard now supports an advanced functionality that allows for ad content testing on specific devices to QA your ad delivery without affecting your live app version. We recommend testing your latest app version on a test device before submitting the final version to the app store. New! Your test device will now receive detailed logs. 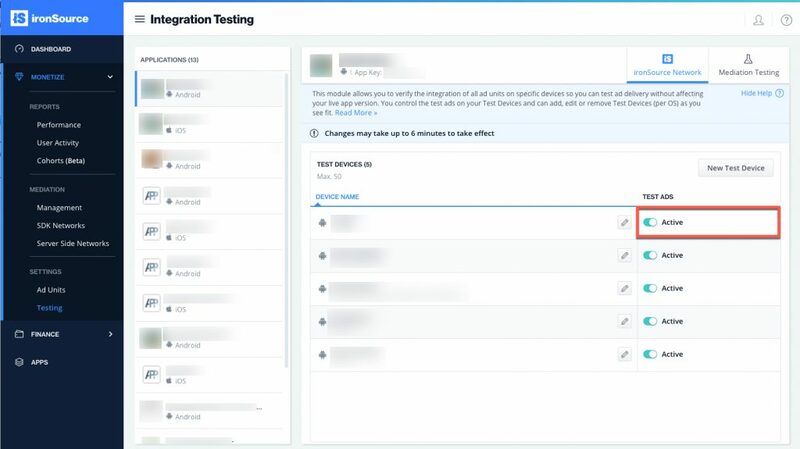 You can now set specific devices that will receive test ad content to evaluate and check ad unit integration. ironSource Network Testing is available for all Ad Units. Go to ‘Monetize’ and under Ad Settings, select ‘Testing‘. Click ‘Save‘. You will then see the test device in the table; you can activate and deactivate test ads in this module at your convenience. 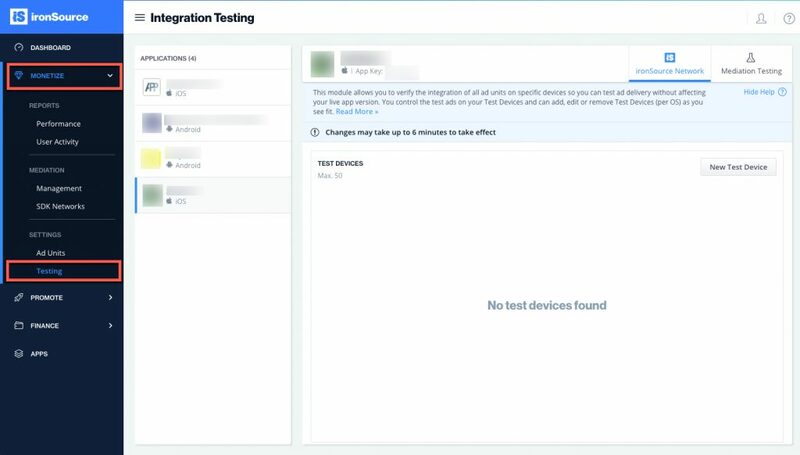 Once you’ve successfully added a test device, you will see it on the ironSource Network and Mediation Testing Module and across all your applications! The Mediation Testing Module is available from SDK 6.4.0 +. Once you’ve integrated our mediation solution, you will be able to test the mediation ad networks’ ad delivery on your app on specific devices. 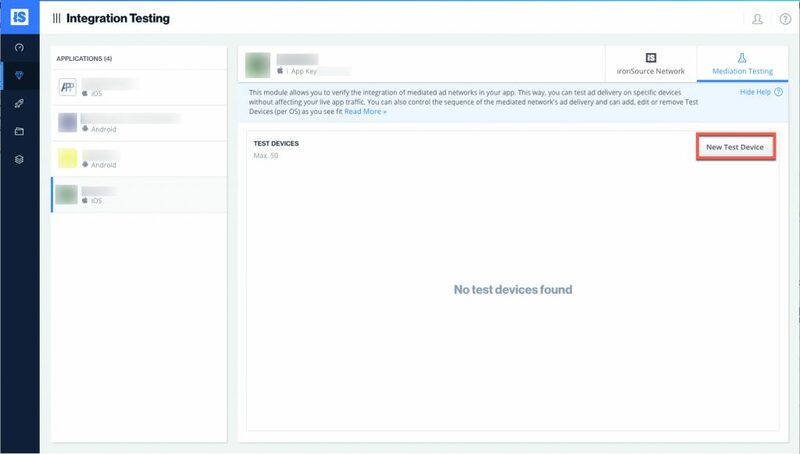 If you have already added a test device the Testing Module, you will see it under the ironSource Network and Mediation Testing tab as well as across all of the apps on your ironSource account. 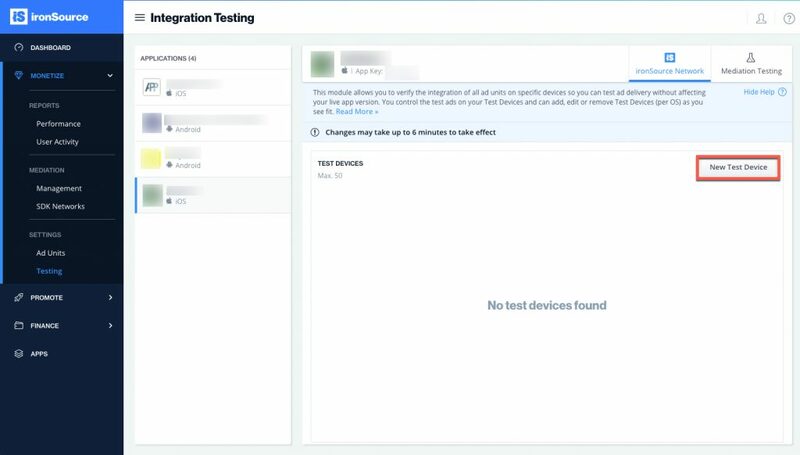 In the case you haven’t added a test device in the Testing module yet, follow steps 3 through 5 above. 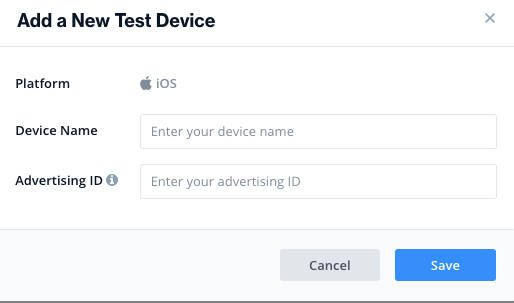 Once you’ve added a test device and have already correctly integrated your preferred ad units an adapter in your app, you will be able to select which networks to test for your integrated ad units. To test Rewarded Video, select an ad network under the Rewarded Video column. 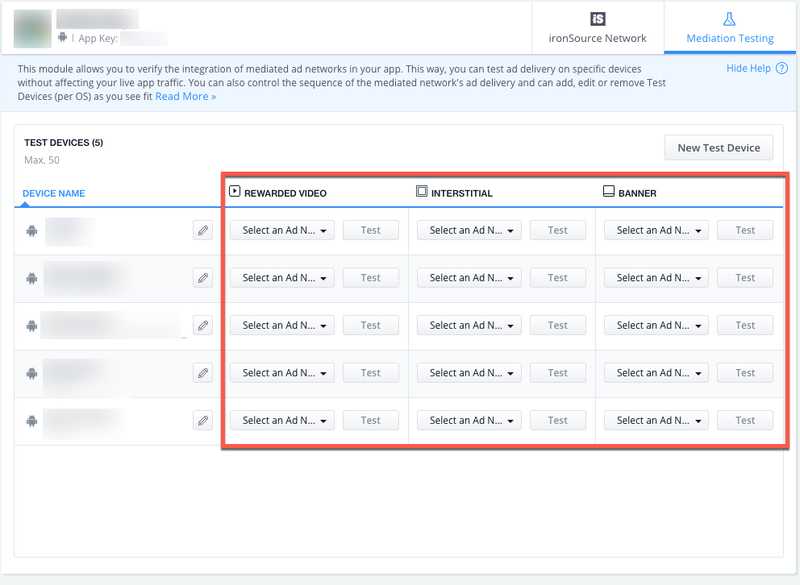 To test Interstitials, select an ad network under the Interstitial column. To test Banners, select an ad network under the Banner column. Click ‘Test‘ to receive ad content from the selected ad network. Once you’ve entered the device and selected the mediation ad source you’d like to test on your application, you will receive ads exclusively from that specific ad network on the assigned device. This allows you to check that ads are being served correctly on the end users’ application. Note: By default, the ad network configuration will reset within the hour. ironSource‘s Test Mode for New Apps facilitates the ad implementation and ad content testing process for developers. When you add an app to your ironSource account, it will remain in test mode until you integrate our ad units and set them to live. 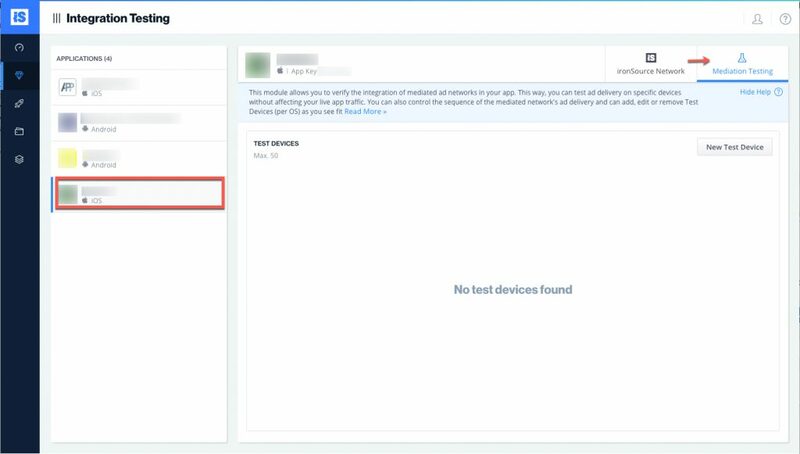 Even if your app isn’t live in an app marketplace yet, you will be able to receive test ad content by assigning test devices in the ironSource Network Testing module. Once you have integrated our ads in your app and it is submitted to an app marketplace, you can go live with our Ad Units. 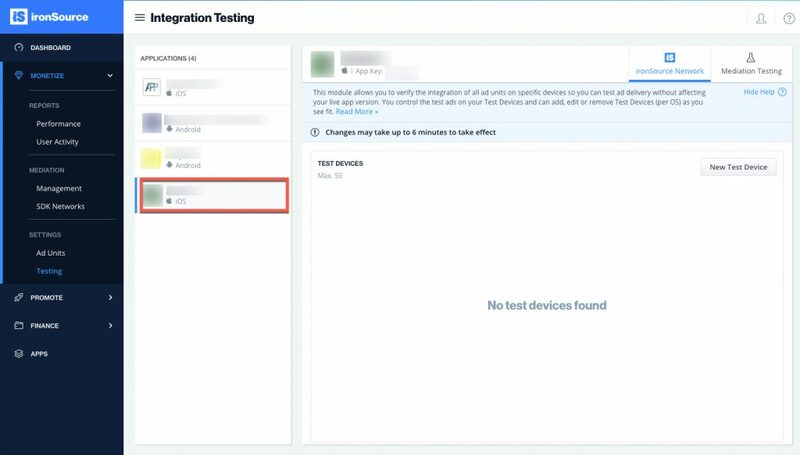 At this point, you will no longer be able to switch that specific app back to test mode, but can receive test ad content on assigned test devices in the ironSource Network Testing module. This enables you to assess new app versions and test ad content without ever affecting your live app version.